Tiger * T10 + FULL HD CA PVR- digital satellite receiver in a closed Linux operating sisteme designed for the reception of satellite TV channels of high-definition HDTV to view free and paid channels with the ability to record via USB and built-in media player. The main difference from the model Tiger * T10 HD CA PVR is the expansion of FLASH-memory up to 8MB and support WIFI adapter and as a result, Internet applications (Youtube, weather, RSS). 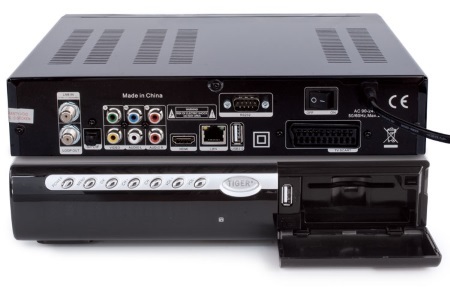 It is important not to confuse this model with the Tiger * T10 HD CA PVR, as the software for each of their own. And in the case of an incorrect update the receiver may be damaged. One of the interesting features of this tuner is also worth mentioning: the high stability of the receiver and media player, omnivorous media player, easy set-up and support of the majority of conditional access cards, a good receiver packaging (HDMI cable included), quick and easy software upgrade, the keys and the channel list through the Internet directly to the receiver or via USB, as well as draw the menu screen at 1920x1080 resolution, making it smoother on a TV with a big diagonal. Warning! It is important not to confuse the model TIGER T10 HD (she 4M Flash memory) model TIGER T10 + full HD 8M (she 8M Flash memory), as its software for each software. 1. Download the current firmware version from our website. 2. Unzip the downloaded file (extension should be left bin) and copy it to a USB storage device, properly remove the drive from the computer. 3. Turn on the receiver, insert a USB storage device (USB flash drive) into the appropriate port of the receiver. 4. Press the USB button on the remote control. 5. Select the firmware file, click OK.
6. Select the software update. 9. After the update the receiver restarts independently. 10. Reset settings to the factory settings MENU - Settings - Factory Defaults - All . For quick editing BISS keys can use the simplified method, when being on a coded channel in BISS, press the PAGE-DOWN button on the remote. To change/add BISS keys, press the GREEN button. To update the list of channels and keys, you need to insert the flash drive into the USB port of the receiver, enter the menu Advanced -> USB, select the file or key channel list, press the OK button on the remote control, and agree with this operation . The letters in the column on the left to save after the letters to select OK.